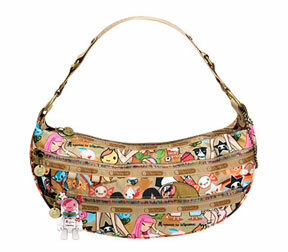 Lately I have been crushing on a few things- Neapolitan color schemes and anything kawaii. Oh Al Gore, you are a brilliant man, enabling me to find a few things on the internet. OK the reappearing tray is Cram Cream, and I found it at reprodeopt Those 3 skeins of neapolitan goodness are actually ACRYLIC *gasp! 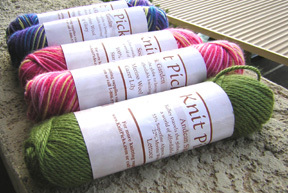 * yarn King Cole Smooth DK, and they are super soft, plan on making baby items for friends. I bought a few yards of this yummy chocolate and robin's egg blue fabric--- its skirt making time, one of these weekends. 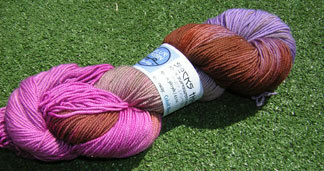 Stephanie's dye work is AWESOME... her manzanita in bloom double skein rests in my craftroom, you can buy it at her shop! 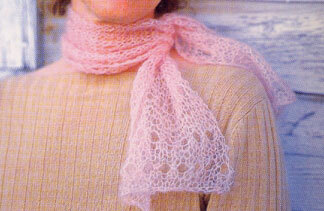 And keeping true to my vow of cotton-- here is some yummy peaches and cream for my mason-dixon knittin'. 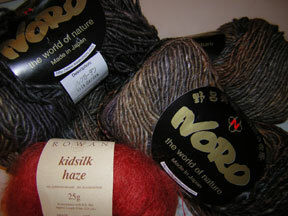 Last week I ordered some great yarns-- and must share a few recommendations. I had to get my hands on some "socks that rock" yarn from Blue Moon Fiber Arts. It just feels yummy, can't wait so make some socks with this stuff. 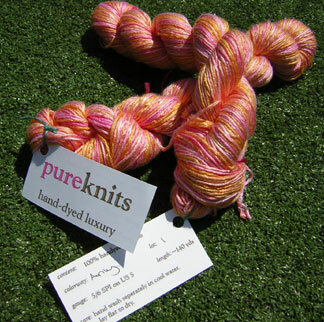 And per Illanna's recommendation, I had to check out the bamboo yarn in the "amy" colorway from pureknits... it was love at first sight. The rain the past week has not been good. It's raining on our exposed house frame and it's heck on my allergies-- (change in pressure and how it's making those wildflowers bloom early) Friday I went to the Dr., I have a severe sinus infection. So now I have drugs :)... life is good, except I missed out on some great get-to-gethers... craftster and my friend's b-day dinner-- but got lots of rest. I am feeling much better. 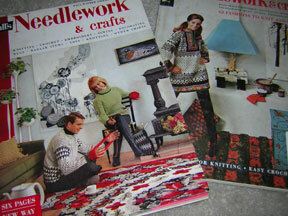 Also got my knitpicks yarn in the mail this weekend. I bought a skein of the alpaca silk (green) to try some swatching for a future sweater and the multi-stripe is for 2 pair of socks. To all my amyville fans, I send a huge thank you to everyone who has shared their kind words and praises about my clay creations... I am so super-charged! 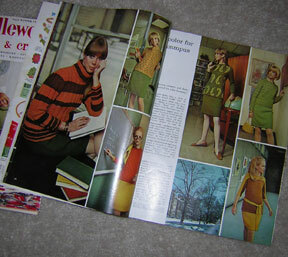 A few days ago I ducked into a vintage book store in Tempe called "Those were the days..." To my surprise I found this stash of vintage McCalls Needlecraft magazines... they are so fun to look at! I will probably go back and buy the rest of them, they are full of inspiration. 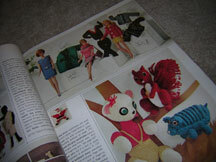 The Barbie mini-knitted outfits are very stylish. 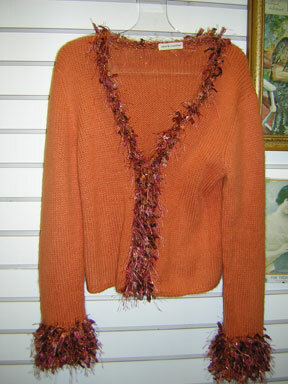 Check out the vintage knitted outfits! 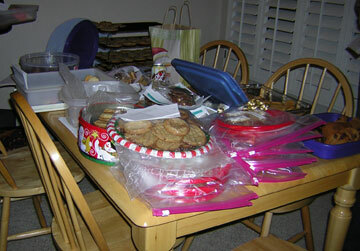 Thursday evening was Alison's Cookie Exchange-- Check out the spread! 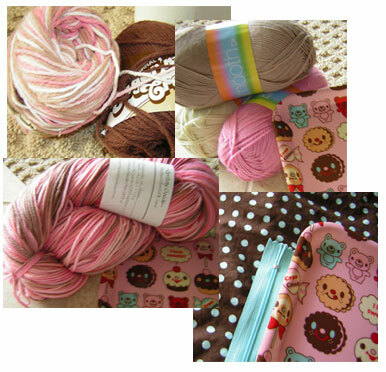 Also added some new additions to the ever-growing stash-- sock yarn and and some cashmerino! yum! 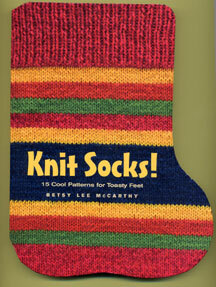 I think next year I will be on my "sock-kick" for Christmas gifts-- everyone needs socks, right? And who doesn't love cozy socks?... back to the elf shack, wrapping up last minute stuff for parties and gifts! I couldn't resist, after making my mini socks, I am now wanting to make socks for normal sized feet-- again another post Christmas project to carry me through to spring. Fun book and I like how it's shaped like a sock! Storms today stopped me from taking pictures of my works in progress --with our camera, the yarn looks better in daylight pictures than indoors. Yes we are off for our second trip-- Purdue vs. Michigan at West Lafayette. It's been a whirlwind week-- and I can't believe we leave at lunch time tomorrow. I will definitely sleep well tomorrow night! 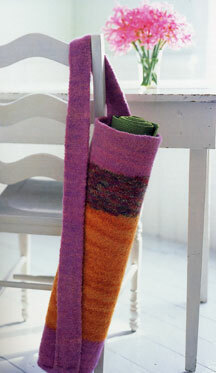 I am going to make a long scarf with the Noro I purchased last week. 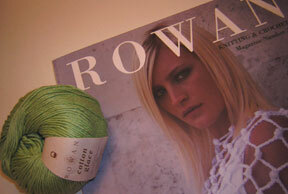 I am so excited to work with this selfstriping yarn! Not a fun Purdue Football weekend. Our trip 1 of 2 to Indiana was great, except for the homecoming football loss :( My friend Kate put up with a lot of crap to get to the yarn store on Friday in Indy-- it's a really difficult one to get to in downtown... but look what I bought. 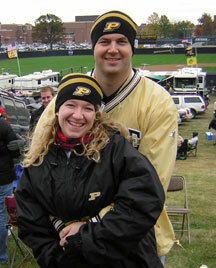 And must show at least one pic of Mark and me tailgating in our "cold weather" attire. We stayed with our friends Rosie and Otie and their daughter Lisa (who is one of my friends from college) and her boyfriend Matt. We definitely had more fun post game hanging out at their house. And the fun part is we do it all again on Thursday when we fly back to see the Michigan game in West Lafayette. We're getting ready for the big weekend. Saturday will be jammed packed between the house drawing (to see if we can be the lucky winners to build in the community we want in Gilbert) and Purdue v. Notre Dame game.